Smashed my previous PB by 1:05 in the process. I'd completely forgotten about this race until I noticed one of the signs on Friday morning whilst out on my run. Once back in the office, I checked if I could enter on the day - I could - and the previous year's results and I thought I'd have a chance at a podium finish so decided I'd do it. Sunday morning I popped down to TVP, registered and entered the race. As is common with races people shoot off from the start and a group of about 8 guys headed off ahead of me. I wasn't too worried and played things safe and ran at my own pace. I was soon up in 5th place and then started reeling in the guys ahead of me. I was in 4th by 6km with the third place guy in my sights: first and second were long gone and out of sight. I finished strongly and in a time of 35:20 gun time and 35:18 chip time shaving 1:05 off my previous PB. Chuffed to bits about getting both a podium finish (got a trophy but no cash :-( ) and a huge new PB. In retrospect, I think I might have been able to break 35mins had I not been scared of being challenged by the guy who eventually came forth. 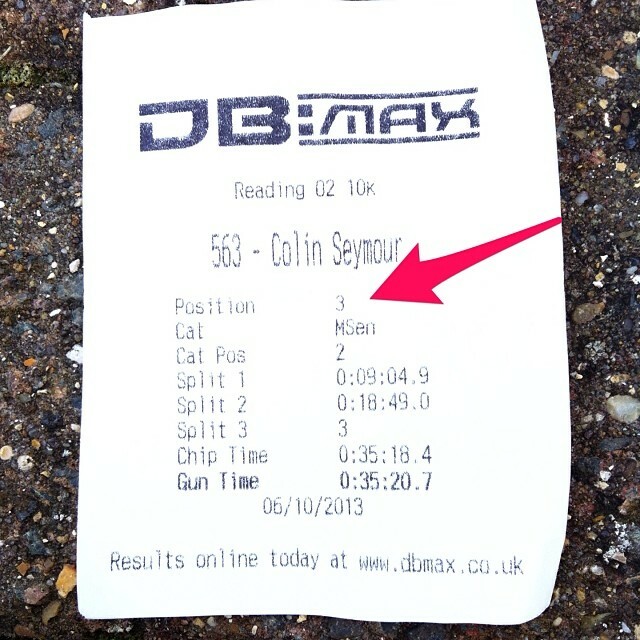 Next up: Abingdon Marathon in which I'm aiming for a sub-3.